Dolls, in the left corner take a peek at Steve Madden’s haute Haylow-G Gold Glitter; to the right plant your pretty peepers upon Mossimo’s pretty Prue Glitter Heeled Platform Sandals in Gold via Target. While the Mossimo stunners sport a 4” heel and 1” platform, as opposed to the 5.25” heel and 1.25” platform of the marvelous Madden’s; for a mere $29.99, in comparison to the $90.00 needed to take Haylow home, they are every bit as capable of making one sparkle with every step she takes – at a price that allows the budget babe to scoop up not one, not two, but all four charming colors (Gold Glitter, Blush Patent, Black Patent, and Red Patent)! Tell me, kittens…will you be a big spender and go for Steve Madden, or be thrifty and spring for Mossimo? Thanks to Bloomingdale’s and Target for the pictures. The madden ones are all kinds of gorgeous. Steve Madden! They are glam! Will be thrifty on this one for sure! I gotta love that Target price! So have to got to Target now! Pretty! A friend of mine is wearing sparkle shoes for her wedding! Oh..so fab! Especially, at Target! i'd definitely have to go for the steve madden ones, they're so pretty! Target's are just as amazing! 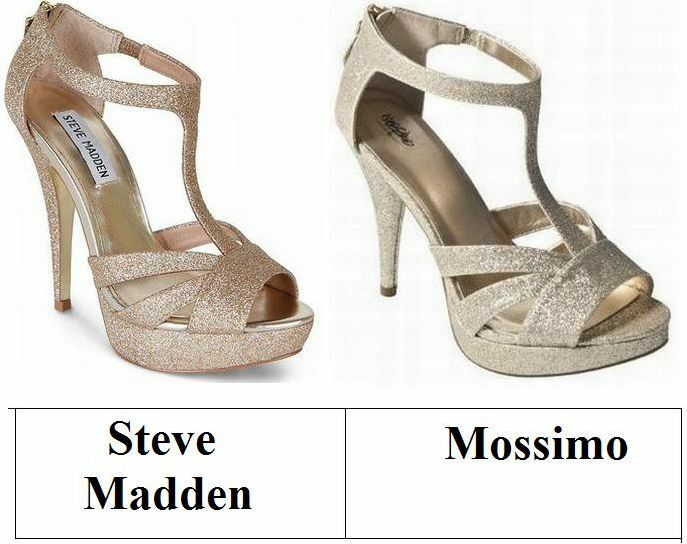 Mossimo is gorgeous, but I will always have a thing for steve madden! Can't help it. i actually like the color of the target ones a bit more!!! so cute!! I normally would pick the Maddens' but really, these are too similar. Target for me! So pretty. I love the sparkles. the glitter mossimos are a fab deal--love target. but i kinda like the look of the steve maddens a bit more. Such a pretty shoe. Perfect for any party or ocassion. They're so similar, I'd defitely pick the Mossimo pair. Wow, the cheaper pair is every bit as beautiful as the expensive! What a great price - I'm going thrifty today! Gold, I love the shine .... love them both but def staying with the Steve Madden ones.... they look more stylish and Steve Madden always fit perfect. Got to love targets very budget friendly versions - these are such a dead ringer i'd have to get the mossimo! These would be so cute for going out. I would go for the Mossimo. I find the hue of the Maddens striking, and their shoes are usually pretty comfy, so this time I will pull out the extra dollars! I love the champagne color of the Maddens! I do love the shade of the Madden ones a lot better! If there was only 1 thing women could wear, I'm wondering if they would say,"Shoes!"? Soooooo pretty!! Another great find! Mossimo all the way. Excellent find Erika!! woohoo for target!! i own soo many of their shoes haha!! Oh my! they're identical ! really thanks for this kind of posts, they really help me/us! I like the more silvery color of the Mossimo! Great find! Usually Steve Madden is the thrifty find, glad to see there are even less expensive alternatives! Shorter heel = no emergency room trip. I'd go for the Mossimo.